The bones and structure of a good detective story are so old and well known that it may seem banal to state them even in outline. A policeman, stupid but sweet-tempered, and always weakly erring on the side of mercy, walks along the street; and in the course of his ordinary business finds a man in Bulgarian uniform killed with an Australian boomerang in a Brompton milk-shop. Having set free all the most suspicious persons in the story, he then appeals to the bull-dog professional detective, who appeals to the hawk-like amateur detective. The latter finds near the corpse a boot-lace, a button-boot, a French newspaper, and a return ticket from the Hebrides; and so, relentlessly, link by link, brings the crime home to the Archbishop of Canterbury. 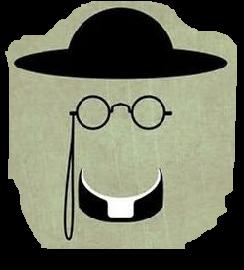 We learn very little if anything about Father Brown's background: he springs out in the first tale, fully realized, or as fully as he will ever be. He is deliberately made rather a cipher, more an absence of characteristics than a character, though at once we see that he is almost the Platonic ideal of the idea priest: calm, gentle, wise, knowing, polite, humble, unassuming, comforting--yet rock-hard and immovable when it comes to the moral sticking place. At the outset, in the very first tale, Father Brown captures the notorious physical and mental giant of a criminal, Flambeau; but soon after, the post-jail reformed Flambeau becomes a private detective and Father Brown's closest (perhaps only) friend. I don't know much about the duties and assignments of Roman Catholic priests (or any other kind, for that matter), but Father Brown seems always to have an awful lot of free time on his hands. To be sure, he chronically gets involved in matters through being called in to do the offices of his vocation, but he never seems to have to account to anyone for his time and how he spends it. He is, in a way, a man-of-the-cloth parallel to Holmes and Watson: adventure forever beckoning and no real responsibilities. Of course, that's unfair: Holmes and Watson do what they do for the thrill of the chase, while Father Brown does it for the spiritual health of the characters. But his quotidian tasks seem never to interfere with his detective ones. For all their immense, romping, colorful variety, Chesterton's fictions uniformly have a clear underlying common element: paradox. The very word "Chestertonian" has passed into the language, signifying a quality found in such pronouncements as "Naturally, having no legs, he won the walking-race easily" or "As there was nothing to drink, they all got tipsy at once." (Gervase Fen, calling it "the Chesterton effect", exhibits "Why was the dead mans's arm cut off? Because he hadn't got an arm.") All these paradoxes have a point, one encompassed in the term he adopted as almost a motto, which term he acquired from a passage in Charles Dickens: mooreeffoc. Dickens recalled seeing that word as a child and being much puzzled by it until, in a flash, he realized that he was seeing, in a mirror reflecting a shop front, the quite ordinary word coffeeroom. Chesterton's paradoxes were each a mooreeffoc: they are only bizarrely bewildering till we recognize that we have been seeing a very ordinary thing wrong-way round. With that tool of paradox, Chesterton attempts to make us see the "ordinary" as extraordinary, or perhaps I should say he makes us see that there is no "ordinary"--the whole of existence is extraordinary. Chesterton does not aim merely to create clever puzzles, nor even merely to illuminate the wonders of the "everyday": he has a staunch moral purpose. He wishes us to see the world as he sees it, as a special creation of the particular God in whom he believes fiercely. But, while his belief is ferocious, his advocacy is strikingly mild; Father Brown, like all his detectors of crime (see Other Chesterton "Detectives" and the Like farther below), comes to us in stories so calm in presentation that it is only on reflection that we see beneath the surface to the grim and rock-hard realities Chesterton alludes to. The little priest was so much the essence of those Eastern flats: he had a face as round and dull as a Norfolk dumpling; he had eyes as empty as the North Sea; he had several brown-paper bags which he was quite incapable of collecting. . . . He had a large, shabby umbrella, which constantly fell on the floor. He did not seem to know which was the right end of his return ticket. The shadow of a smile crossed the face of his round, simple clerical opponent. "Oh, by being a celibate simpleton, I suppose," he said. "Has it never occurred to you that a man who does next to nothing but hear men's real sins is not likely to be wholly unaware of human evil?" Of course, that is too facile, else there would be many real-life Father Browns, and there aren't (fiction notwithstanding). But Chesterton meant his protagonist not as a realistic character but as a sort of moral spotlight that he could turn on such issues as seemed good to him to illuminate. Naturally, such a didactic approach, especially within the confines of a strictly classical-form detective short story (there were no Father Brown novels), is an adventure all too likely to miscarry unless the writer be possessed of something at least near to genius. Chesterton was. There is somewhere in Brompton or Kensington an interminable avenue of tall houses, rich but largely empty, that looks like a terrace of tombs. The very steps up to the dark front doors seem as steep as the sides of pyramids; one would hesitate to knock at the door, lest it should be opened by a mummy. But a yet more depressing feature in the grey façade is its telescopic length and changeless continuity. The pilgrim walking down it begins to think he will never come to a break or corner; but there is one exception--a very small one, but hailed by the pilgrim almost with a shout. There is a sort of mews between two of the tall mansions, a mere slit like the crack of a door by comparison with the street, but just large enough to permit a pygmy ale-house or eating-house, still allowed by the rich to their stable-servants, to stand in the angle. There is something cheery in its very dinginess, and something free and elfin in its very insignificance. At the feet of those grey stone giants, it looks like a lighted house of dwarfs. "You call it queer, and I call it queer," said the other, "and yet we mean quite opposite things. The modern mind always mixes up two different ideas: mystery in the sense of what is marvellous, and mystery in the sense of what is complicated. That is half its difficulty about miracles. A miracle is startling; but it is simple. It is simple because is is a miracle. It is power coming directly from God (or the devil) instead of indirectly through nature or human wills. Now you mean that this business is marvellous because it is miraculous, because it is witchcraft worked by a wicked Indian. Understand, I do not say that it was not spiritual or diabolic. Heaven and hell only know by what surrounding influences strange sins come into the lives of men. But for the present my point is this: If it was pure magic, as you think, then it is marvellous; but it is not mysterious--that is, it is not complicated. The quality of a miracle is mysterious, but its manner is simple. Now, the manner of this business has been the reverse of simple." The storm that had slackened for a little seemed to be swelling again, and there came heavy movements as of faint thinder. Father Brown let fall the ash of his cigar and went on. "There has been in this incident," he said, "a twisted, ugly, complex quality that does not belong to the straight bolts either of heaven or hell. As one knows the crooked path of a snail, I know the crooked track of a man." "Now I know," replied the priest, "the profession of Mr. Todhunter." "Dr. Hood," he cried enthusiastically, "you are a great poet! You have called an uncreated being out of the void. How much more godlike that is than if you had only ferreted out the mere facts! Indeed, the mere facts are rather commonplace by comparison." "I have no notion what you are talking about," said Dr. Hood rather haughtily; "my facts are all inevitable, though necessarily incomplete. A place may be permitted to intuition, perhaps (or poetry if you prefer the term), but only because the corresponding details cannot as yet be ascertained. In the absence of Mr. Glass—"
"That's it, that's it," said the little priest, nodding quite eagerly; "that's the first idea to get fixed; the absence of Mr. Glass. He is so very extremely absent. I suppose." he added reflectively, "that there was never anybody so absent as Mr. Glass." "I mean he is absent from the Nature of Things, so to speak." The Father Brown stories, as suggested above, are at once quite various and quite uniform. We are seeing the same cast performing the same script, no matter the variety of their costumes. The stories are delicious, but as with real sweets, it is inadvisable to take too many at one sitting. Ignore that principle and you risk at the least a certain cloying, if not an actual bellyache; observe it, and you have a nice parade of eminently and elegantly pleasing confections. There is also a Chesterton/Father-Brown page at the site of the specialist mystery publishing house The Battered Silicon Dispatch Case, offering a very expensive but succulent new truly complete, richly illustrated, and extensively annotated two-volume special edition of the Father Brown tales; the page includes some background information. Chesterton never wrote a Father Brown novel; though the number of short stories is large, each is short and they make a reasonable one-volume anthology--there's no point in buying them in any other form. Chesterton had a strong fondness for the detective story, both in and of itself and as a vehicle for moral didacticism. Several of his creations--each encompassed in a single volume, or sometimes a single story--is worth making the acquaintance of.